[Eberhard] wanted his own reflow oven but didn’t really want to mess around with the internals that control the heating element. He put his microcontroller programming experience to work and came up with an add-on module that controls the oven by switching the mains power. 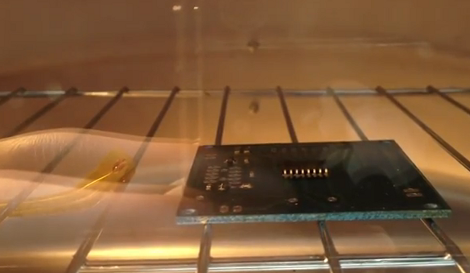 The image above shows a board in the midst of the reflow process. If you’re not familiar, solder paste usually comes with a recommended heat curve for properly melting the slurry. [Eberhard] managed to fit three of these temperature profiles into his firmware. The ATtiny45 which makes up the controller samples oven temperature via the thermistor seen next to the board. A PID algorithm is used to calculate when to switch mains power on and off via a relay. One button and one LED make up the controller’s user interface for scrolling through the three preprogrammed temperature profiles. It looks like it works great, see for yourself in the clip after the break. I made something similar to this to make a sous vide machine once but the clicking of the relay made me go crazy. I’ll switch it to a solid state FET or something similar. if you’re enough advanced in electronic to require a reflow oven, then you could at least use a Triac instead of a mechanical relay. Those little things have been around us for decades and they are pretty simple to operate. … and require galvanic isolation and probably zero crossing detection. I would definitely use a relay for something as simple as this. It’s perfectly adequate and cheap too. How many actual cooking ovens bother with triac control? And… you can get triacs with zero crossing detection in them. One problem solved. nes, opto-isolated TRIAC drivers are available with or without zero-crossing detection built in. Not as cheap as mechanical relays, but it will last longer, can be switched faster, and is completely silent! To nes: No you don’t need zero crossing detector with triac. Just run it on and off with opto isolator, just like relay. Use some slow pace, for example 1 sec on 1 sec off. switching normal relays rapidly will wear them out; you can get an SSR that will last longer and do mains for less than $10 on ebay. Why not use a triac and triac driver IC ? Marcus: I know what you mean, the clicking of the relay on my Makerbot Cupcake printer is driving me crazy. Fortunately, the soldering cycle takes less than 5 minutes and I’m sitting and waiting in front of the oven anyway during this time. There are max 5 to 10 relay clicks until the PCB is soldered. That’s definitely different than waiting for an 1 hour 3D print or a 3 hours sous vide meal. I had this for years at my last workplace. Yup, that’s exactly where we have ours from. But your link doesn’t show the controller, but just the oven with some fancy accessories. and this sort of ovens works pretty good. i guess you can save some money by diy! PS: We at the shackspace hackerspace in Stuttgart, Germany. 219 EURs – are you kidding? Christian, Nomad: Really? Suggesting 130€ oven kits and 220€ reflow controllers? The oven I use cost about 20-40€ and the parts for the controller I built would have set me back about 5-7€. Well, yes, the oven kit is a tad overpriced…one doesn’t usually need all the stuff that’s in this kit. When it comes to the controller, that’s another story. I want to see you fix the BGA graphics card of a HP Notebook which desoldered itself because of a screwed up cooling design. Ours can do that. I honestly don’t know if I could fix a BGA graphics card of a HP Notebook with my oven/controller. But I guess neither do you. It would be probably an issue of the right temperature profile in the controller’s firmware. I never said, that my reflow oven/controller can be used to solder anything. It doesn’t need to! I built this thing because I needed an easy way to solder my own SMD designs, containing mostly simple 0603-sized parts, some SO chips and maybe a TQFP controller or such. And no, I don’t want to solder these parts with a soldering iron. I really don’t know why I should buy an out of the box 130€-oven or 230€-oven controller for this, when I can get the job done with a hack for under 50€ (respectively under 7€ for the controller alone). > But I guess neither do you. Well i didn’t say i could, but i said that our controller is capable of that. Some other dude did that. Of course not just once. Well, the 230€ are a bit overpriced if you rethink, what this actually is on the inside…probably the same, what you did. But then think of things like how often do you use it? How secure is it? then things like: Professinally made casing and PCB, SSR, calibration, development and assembly costs including salary for those employees and so on. With >100 Members in a hackerspace you probably don’t want to use the “it may work for me, i think” solution. On the other side, for a one man shop the 230€ solution is a way too big overkill. Thanks for posting, Mike. And nice work with both the hardware & software, Eberhard! :) Simple, clean, use what you have around: those are the trademarks of a *good* hack, IMHO. I’d thought we’d ditched the bitching on HaD comments a while ago, but unfortunately, some people can’t help but post “why didn’t you do X or Y?!?”. Now in defense of what he used, I’d MUCH rather use a relay than an SCR/Triac. Put down the pitchforks! ;) My experience has not been all that good concerning solid-state relays and related components, but my experience with mains stuff is isolated to industrial electronics in machine tools. In those applications, contactors/relays hold up longer and will handle abuse to a greater extent. Maybe it’s to do with the quality of the Mitsubishi/Mazak boards…? I admit, I love to watch the sparks fly when they’re clackin’ away. And knowing myself, I would RATHER have a loud clickety-clack relay on the reflow controller, for the simple fact that I’ll know it’s operating. The old maxim of keeping it simple, i.e. no more complicated than absolutely necessary) was definitely applied here, and in a straight-forward way. I’ve been wanting to build one of these units for quite some time, and now I’ve got more motivation to finally get to it. i have some attiny85 that i didn’t get a chance to use for Halloween. I might build one of these. I’ll probably go with an SSR. No technical reason. I just had one of these laying around since a while. Those of you suggesting a triac do realize that a toaster oven is going to consume 1200 watts or more ? That means a heat sink, keeping it isolated, the support components, vs a relay . Relays with ratings of 100,000 operations are easily and cheaply bought. If solid state switches were the answer you wouldn’t find so many home appliance makers using relays. Every part has an area where it is best used and high current loads are not ideal for solid state switches. I would use a relay unless you think you are going to exceed the 100K life of even the cheap relays. Does normal/standard household oven can really be heated up to 250°C in less than 5 minutes?Since the soldering process take about less than 5 minutes. I’m pretty sure, that an incubator oven has a sophisticated temperature management. I guess, the goal of an incubator oven is to slowly increase the heat and then hold the target temperature really exactly. There are controllers specially designed to transform domestic ovens into reflow ovens, you can find them in n_electronics (www.nelectronics.org), adafruit (www.adafruit.com) or drotek (www.drotek.fr). Some of them are really cheap.